Adding curated content to your blog or website can – and should – be much more than placing a few titles and links. You can turn each link you curate into a blog post with its own unique URL (aka permalink) that will be indexed in search engines, contribute to your SEO efforts and be shared individually by your readers on social media. Just like any regular blog post, a curated post is a blog entry in your blog platform or your content management system. Its content consists by default of a title, an image and a quote from the original piece but to be effective, you shouldn’t stop at that. 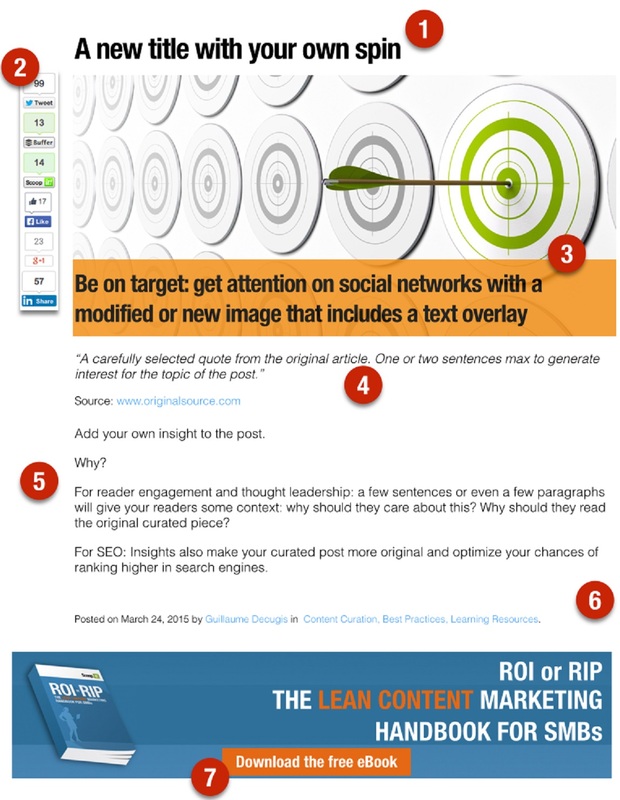 Here are 7 ways you can make your curated content highly effective. Put your own spin on the topic at hand by adding a title that will make your target audience want to click. By doing this you can also present the curated piece in the right context for them. Having buttons that allow your audience to share the curated piece on various social media is exceedingly crucial as it will improve the visibility of your content and also engages the users. Just like with regular blog posts, adding suitable and attractive images to your curated content is of prime importance as these immediately gather the attention of your audience. Having a text overlay over your images is even better, because it helps you start telling the story to the user as soon as he/she glances at the image. It has recently emerged that curated content shared with an image on social media garners 88% more clicks than normal posts. You must extract at least one meaningful quote from the original post and link to it in a way that it is visible. It needn’t be more than one or two sentences, but it gives your audience a flavour of the original content. This is probably the most crucial of all steps – annotating the curated piece with a few well-written lines of your own that will provide invaluable context for your audience. In a few lines, you must explain to them why they should read the original curated content; this also engages them by exhibiting your thought leadership. Another added bonus to this is that such insights will drive your search engine ranking higher, thus helping you benefit from SEO. Categorizing your curated content makes it easier to be archived and indexed, and hence reaps more hits from search engines. It is not merely enough to grab the audience’s attention and have them read your curated content. You must then ensure that the user comes back again to your blog; this can be done by adding Call-to-actions to your posts that will help you convert your user into a regular subscriber or customer. Following these 7 easy steps will drastically improve the quality of your curated content and drive more traffic to your blog.